Technical Car Experts Answers everything you need: How TO replace left front fog light unit ON 2009 toyota prius? How TO replace left front fog light unit ON 2009 toyota prius? 1. Remove the screws attaching either the drivers side or passenger side (whichever bulb) plastic skid plate to the bumper. 2. Pull the black plastic (not the bumper) down so that you can reach up behind the fog light assembly. 3. Grab the connector that sticks out of the fog light assembly and twist. I don't remember if it's clockwise or counter clock wise.So try in both side one by one. 4. Disconnect connector from the bulb. 5. install the new bulb in the socket. 7. Replace plastic and screws. Remove the fog light grille panels. There are two clips on top and two on bottom that secure the panels to the bumper. (No screws) I used a small screwdriver wrapped with tape to find and release the clips. Then the panels pull out forward. There is a small plastic clip that secures the fog light adjustment screw to the bumper. (This is a hollow plastic clip which surrounds the head of the adjustment screw). You can feel the clip just below / above and to the side of the light socket. If you compress the sides of that clip with pliers, you can then pull the fog light assembly forward. You will notice that something else catches the assembly at this point. Look on the left side of the fog light housing and you will find a small piece of the bumper plastic which interferes with the assembly. If you use a small screwdriver again, you can push that plastic out of the way. Now the assembly will pull out. To reinstall, simply push the fog light assembly back into the bumper and reinstall the light bulb. I am attaching the two pages from service manual detailing the removal of the fog lamp assembly. you can just pop the grille that holds the light in place. Your lower grille is made of 3 pieces. 2 short pieces at the foglights and 1 long piece in the middle. The side pieces are held in place by little hooks on the top and bottom. They hook onto the bumper cover. I found out by pulling on the grille and it started to pop out. Just got slow. The lower hook breaks fairly easily. You can buy replacements for around $40. The Toyota Prius hybrid automobile comes equipped with a set of auxiliary fog lights. The fog lights are mounted low, beneath the marker lights, to illuminate the road when fog is present. Remove the engine under-cover from below the fog light you need to change. The cover is secured with bolt on the front side and a plastic clip on the outer-rear of the cover. To remove the clip, reach into the front wheel well and grasp the clip. Depress it, and push it down out of the cover. Reach up through the space the cover conceals, and grasp the fog light electrical connector. Depress the plastic retainer clip on the outside of the connector, and pull the connector off the fog light socket. Rotate the fog light bulb socket counterclockwise to release it from the fog light housing, and pull the socket and bulb out of the housing. Pull the old bulb straight out of the housing, and insert the new bulb. 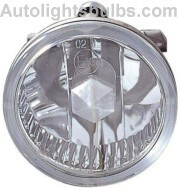 Insert the bulb and socket into the fog light housing, and turn it clockwise to lock it into place. Replace the under-cover. Replace the bolt, and push the clip up through the hole, locking it into place. Labels: How TO replace left front fog light unit ON 2009 toyota prius.